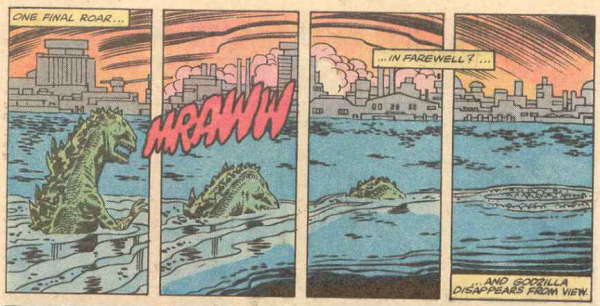 Godzilla leaves…never to be seen again until he’s seen again! This is it, the final issue of the Marvel Godzilla series! It’s the story the prior two years was all building towards! Okay, maybe the prior 5 months or so. But close enough! 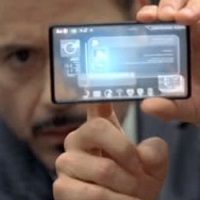 J. Jonah Jameson is upset that Peter Parker ain’t answering his phones and they need a photographer on this stat! 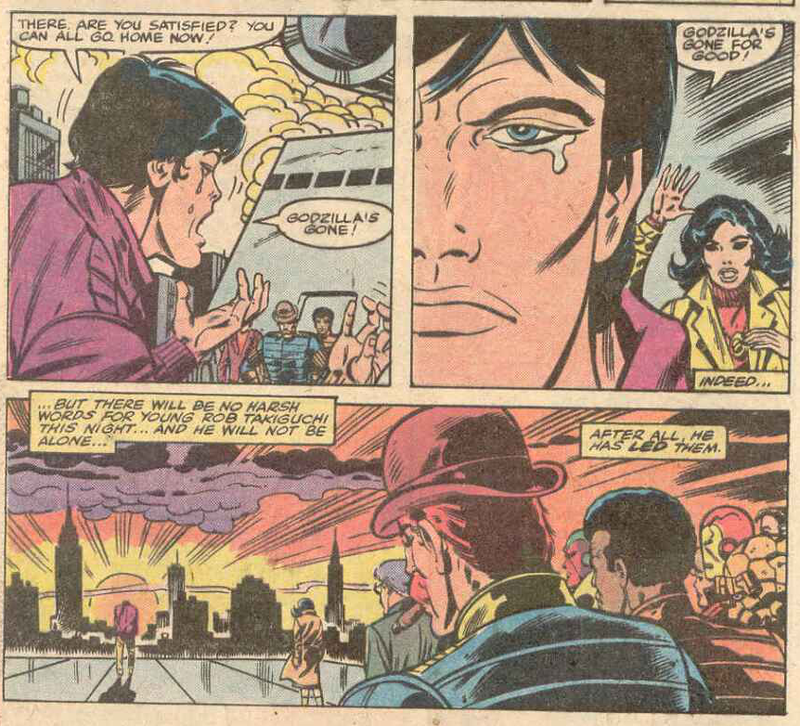 Robert Takiguchi keeps going on the bridge of the helicarrier and yelling at Dum Dum, so Robert gets confined to quarters! 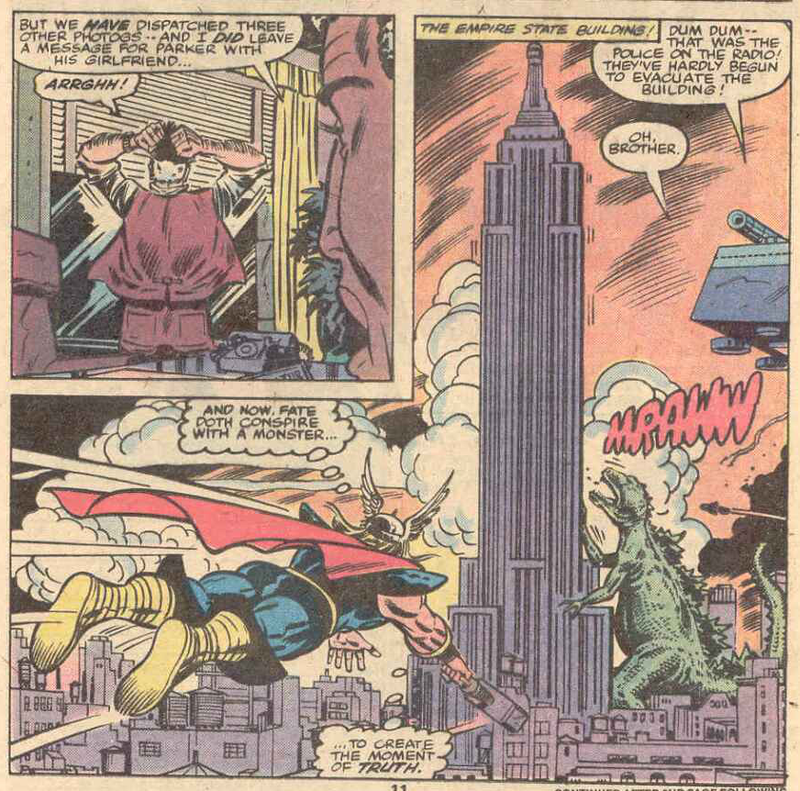 Godzilla and Thor each push the Empire state building, while everyone else attacks Godzilla in a cool two-page spread. 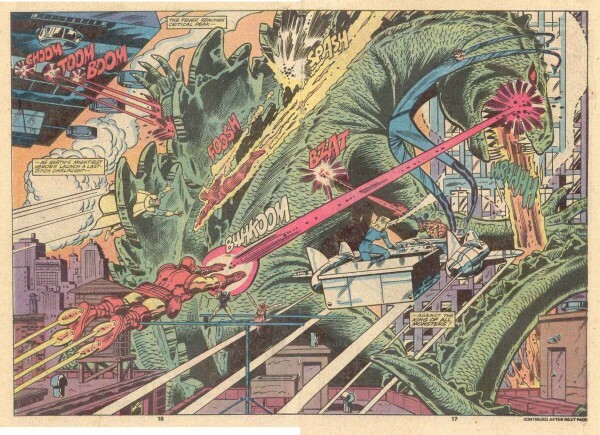 I have a feeling the artists like drawing huge spreads of Godzilla attacking things. Finally, Robert escapes his room and goes on deck of the helicarrier to talk to Godzilla. His tears soften Big G, who picks him up and listens to Rob’s heartfelt plea for Godzilla to go away from people so he won’t be in trouble any more. 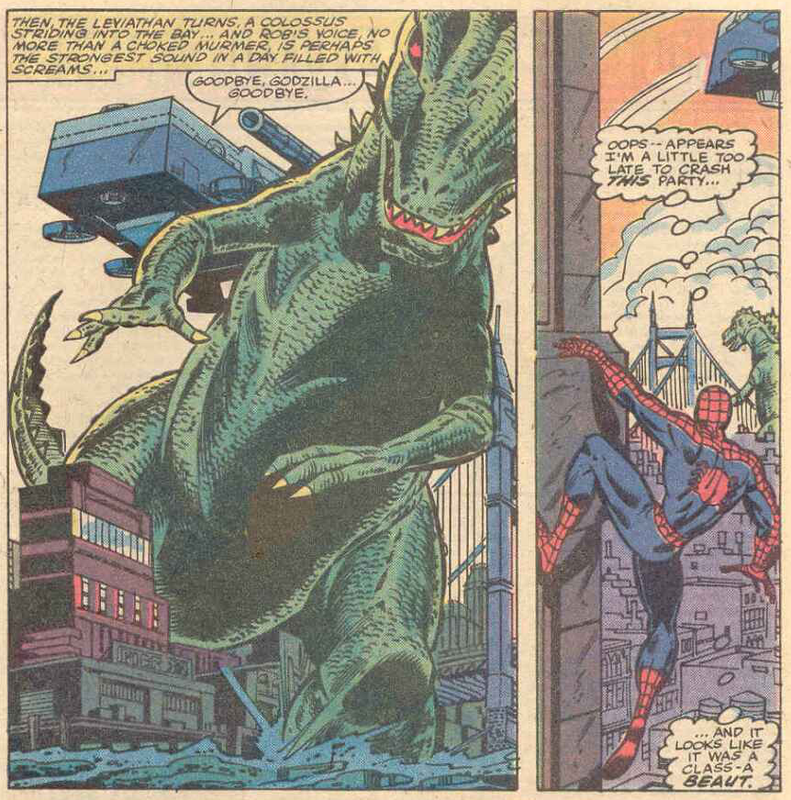 Spiderman shows up to take one photo, the cover drawing of Godzilla leaving. Godzilla walks away and everyone is sad. The tears flow like the river they were battling over. It’s the end….forever! 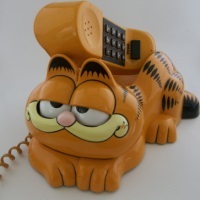 Hi, it’s me, the actor who played Iron Man in that movie Iron Man! I just wanted to let you know that Godzilla shows up in some Iron Man comics! Yes! Your job isn’t done yet, lazy-face! Get back to work! 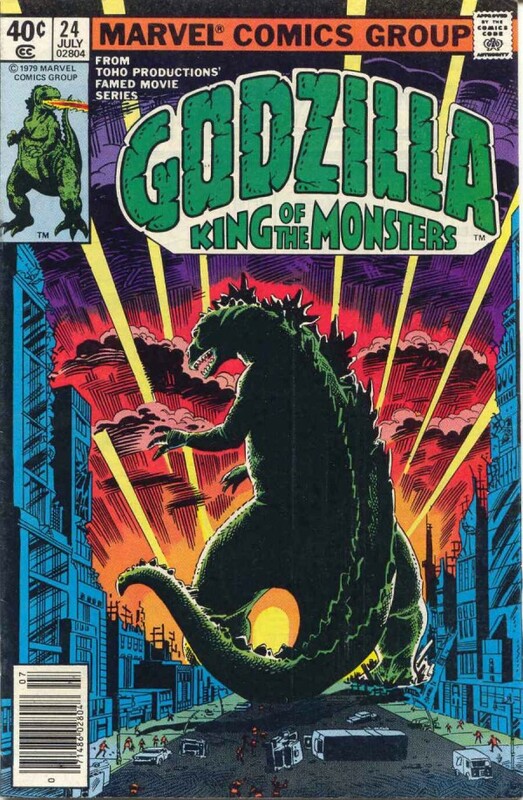 Okay, I guess March of Godzilla 2013 will continue…with Iron Man #193! Until then, make sure you keep up with the Godzilla Marvel Splash Page! When will Hulk show up on his bike to one-punch this guy? 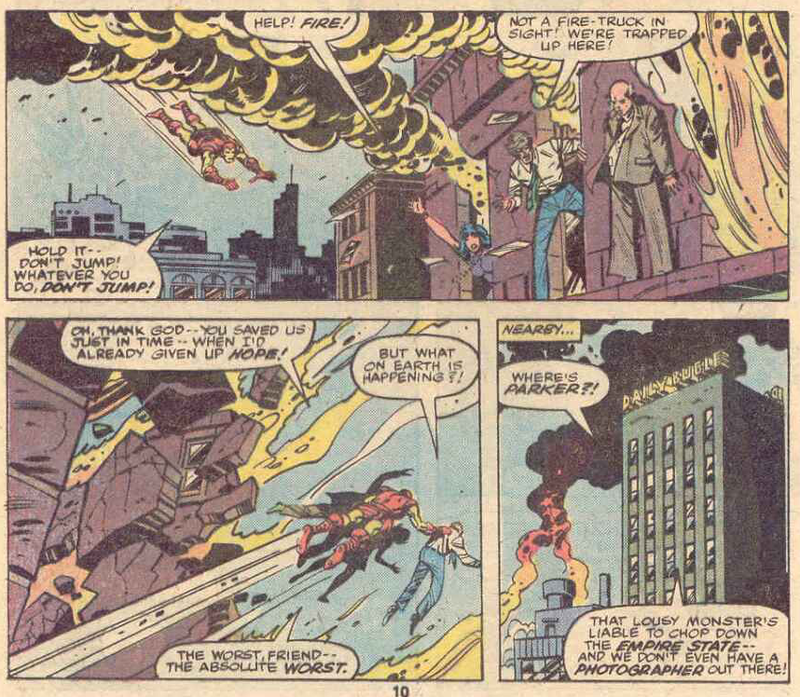 Wow, 9-11 imagery decades before 9-11! Spiderman was late because he’s being rebooted AGAIN!